What type of organic molecule is this? You probably answered “DNA.” Today, it is commonly known that DNA is the genetic material. For a long time, scientists knew such molecules existed. They were aware that genetic information was contained within organic molecules. However, they didn’t know which type of molecules play this role. In fact, for many decades, scientists thought that proteins were the molecules that carry genetic information. 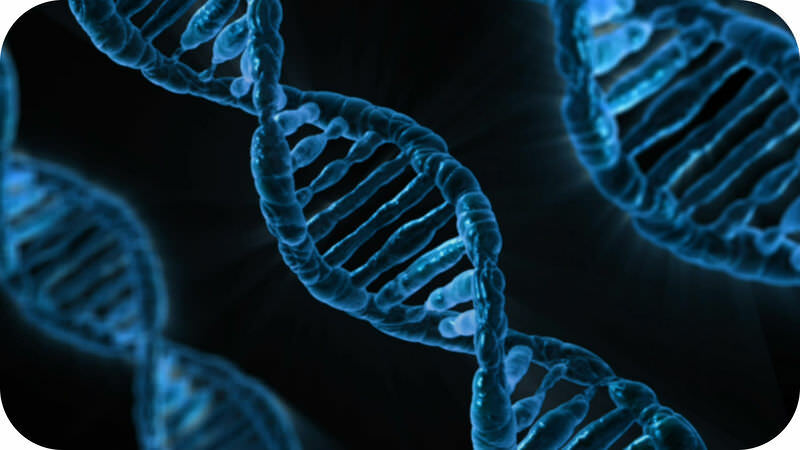 In this section, you will learn how scientists discovered that DNA carries the code of life. Many scientists contributed to the identification of DNA as the genetic material. In the 1920s, Frederick Griffith made an important discovery. He was studying two different strains of a bacterium, called R (rough) strain and S (smooth) strain. He injected the two strains into mice. The S strain killed (virulent) the mice, but the R strain did not (non-virulent) (see the figure below). Griffith also injected mice with S-strain bacteria that had been killed by heat. As expected, the killed bacteria did not harm the mice. 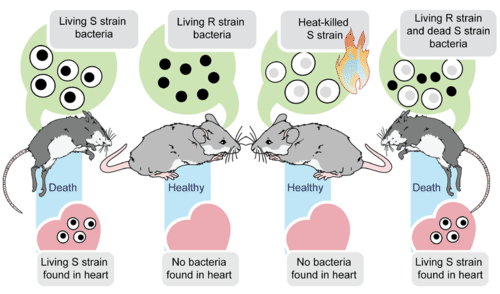 However, when the dead S-strain bacteria were mixed with live R-strain bacteria and injected, the mice died. Based on his observations, Griffith deduced that something in the killed S strain was transferred to the previously harmless R strain, making the R strain deadly. He called this process transformation, as something was “transforming” the bacteria from one strain into another strain. What was that something? What type of substance could change the characteristics of the organism that received it? In the early 1940s, a team of scientists led by Oswald Avery tried to answer the question raised by Griffith’s results. They inactivated various substances in the S-strain bacteria. They then killed the S-strain bacteria and mixed the remains with live R-strain bacteria. (Keep in mind, the R-strain bacteria usually did not harm the mice.) When they inactivated proteins, the R-strain was deadly to the injected mice. This ruled out proteins as the genetic material. Why? Even without the S-strain proteins, the R strain was changed, or transformed, into the deadly strain. However, when the researchers inactivated DNA in the S strain, the R strain remained harmless. This led to the conclusion that DNA is the substance that controls the characteristics of organisms. In other words, DNA is the genetic material. This is a lesson from the tutorial, Genetics and you are encouraged to log in or register, so that you can track your progress.